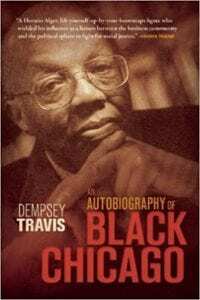 Perhaps the motivation for the Travis family to re-release the 1981 publication of Dempsey Travis’ autobiography was to provide an education to many of the inherent convictions Mr. Travis had toward his personal vision of never giving up and seeking out what he believed he could achieve. By the end of his life, he had risen to admirable status in the real estate world and became a solid voice and advocate for the black community. We live in a time where there is more than a sublime suggestion of racial discourse and I would surmise if a man were to take to the streets and ask a variation of nationalities with diverse cultural background: “What do you think the current climate is toward racial issues in our country today?” the answers would be spectral. It is no secret there have been many eras of unjust and mistreatment in this great nation of America. Perhaps this is why An Autobiography of Black Chicago has been re-released now. Mr. Travis breaks down his autobiography chapter-by-chapter sharing personal accounts of what it was like to begin his life in 1920’s Chicago—a time when it was roaring in the smoke-filled speakeasies and prohibition was a word that applied to those on the outside of those speakeasies. Time marched forward for Travis and with it came a further understanding that because of the color of his skin, his rights were limited due to the color of his skin. Travis continues to step his story forward and with its unfolding, there is an evolution and purpose to why it was important for him to seek a sound education; overcome the obstacles of being “black skinned” and make a difference. While I cannot say I can relate to what it must have been like to be “black” back then—I am white and a few years younger-I do believe every human being no matter their race, color or creed do have a common intersection of knowing and feeling when it comes to the experience of injustice and that, I believe, is the essence of what the take away is from this particular book. Travis had moments in his autobiography where I believe it was close to impossible to not vent his anger and frustrations he and his brothers in arms experienced in their respective lifetimes. While there is nothing offensive in the way the book was crafted, it is abundantly clear Mr. Travis used his pen to deliver his perception and message; such as: "...The Sivart mortgage banking presence in Chicago not only raised the “cotton curtain” between the black community and the FHA, it also created jobs for blacks within the mortgage banking industry in “lily-white” companies that had never previously considered a black either for a job or a mortgage application..." I had never heard of Dempsey Travis before reading his book. I migrate toward historical works because history is an intrinsic element to the evolution of any society. I believe Mr. Travis delivered a sound perspective and historical roadmap of his experience of growing up in a time and place when change was a necessity versus an option. Quill says: An Autobiography of Black Chicago is an interesting account of the importance of focusing on the will to succeed no matter the color of one’s skin.